Natural algae has been around for more than three billion years and has been the sujbect of study by various Nobel prize winning scientists. Dr PPARs, the product presented in this site, is a whole, raw, vegetarian and living food produce. It is not a fragment, not an extract, nor is it a synthesized product. There is no attempt to measure up or compare its nutrients to the Required Daily Allowances (RDA) suggested by the Food and Drug Administration (FDA). About 60% of its weight is the composition of various amino acids. This is 300~400% more protein than beef or fish. It is a complete plant protein with 20 amino acids (It is the amino acids that build needed neuropeptides which feed the delicate neurotransmitters or "chemical messengers" of the brain and its nervous system.) Therefore, Dr PPARs is one of the highest natural sources of DNA and RNA. Dr PPARs are also filled with chlorophyll, phycocyanin and superoxide dismutase, SOD (antioxidant) and various carotenoids. It is one of the richest sources of nature's pigments: chlorophyll and beta-carotene. Alpha and Beta-carotene with antioxidant power hundreds of time more protective than vitamin E and C. Many other antioxidants in the form of mixed-carotenoids: licopene, lutein, quercitin, astaxanthin and many more. It contains Phycocyanin – A natural powerful blue anti-oxidant with anti-viral, anti-inflammatory properties. Research has shown that Phycocyanin plays a major role in Adult Stem Cell Regeneration. Increase in bone marrow blood cells - Red/White/Platelets. It contains 12 vitamins and 23 minerals and trace elements all in organic, usable form. The vitamins include: beta-carotene, B-1, B-2, B-6, B-12, vitamin C, niacin, choline, folic acid, pantothenic acid, biotin, vitamin k, vitamin E. Its minerals include: calcium, chlorine, chromium, cobalt, copper, germanium, iodine, iron, magnesium, manganese, nickel, phosphorous, potassium, selenium, sodium, zinc. It contains more vitamin B-12 than beef liver, therefore it is an excellent plant source of vitamin B-12 that is often lacking in many vegetarian diets. Dr PPARs also contains more than 4,000 natural enzymes. This active, enzymatic property contributes to the efficient digestion of fats, carbohydrates and proteins, allowing greater assimilation of nutrients and proper elimination of toxins without depleting the body's enzyme reserve, thus letting the body to utilize its enzymatic reserve for crucial bodily function, including energy production, detoxification and elimination, repair and rebuild of tissues and cells, beefing up the immune system to fight inflammation and disease etc. It contains a non-cellulose, completely digestible, thin celled-wall. Anyone who is familiar with chlorella knows that chlorella’s hard outer cell wall is the cause of its low digestibility rate. Until now, the best digestible chlorella pyrenoidosa on the market provided a digestibility rate (after being processed to break the cell wall) of 85% in about 5 hours after it ingestion. However, the actual absorption is only about 73%. Whereas, Dr PPARs has a soft outer cell wall that does not require to be broken. This enhances its digestibility and absorption rate to reach an amazing level of between 95-98% in 1 to 2 hours after it is taken. In the first 2 hours after ingestion, Dr PPARs delivers up to 25% more nutrients than any other chlorella product in the world. Any product is only as good as its ability to be used by the body. It’s not the amount of nutrients you consume but the amount your body utilizes that makes the difference. A phytoalexin produced naturally by several plants like grape skin to ward off attacks by pathogens such as bacteria or fungi. A key ingredient in red wine that helps prevent aging, blood clots, damage to blood vessels & reduces "bad" cholesterol. 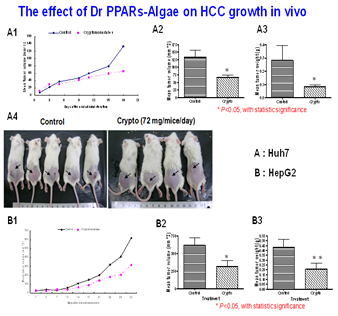 The most unexpected & interesting observation for Resveratrol is the upregulation of PCG-1 alpha, the co-activator of PPARs. Each harvest is analyzed for quality assurance to insure it is free of toxins and contaminants and GMP Certified. It is Kosher & Vegan certified, without chemical additives, binders and fillers. Caution: anyone with a medical condition should always consult a doctor before consuming any form of health products. Patients on medication must never attempt to play doctor by substituting Dr PPARs with their drugs. Dr PPARs serves as a dietary supplement to assist the patient through their own healing programs.